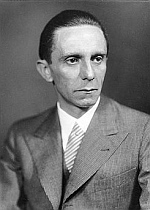 Dr. Paul Joseph Goebbels was a German politician and Reich Minister of Propaganda in Nazi Germany from 1933 to 1945. As one of German dictator Adolf Hitler's closest associates and most devout followers, he was known for his zealous oratory and anti-Semitism. He was the chief architect of the Kristallnacht attack on the German Jews, which historians consider to be the beginning of the Final Solution, leading towards the genocide of the Holocaust. was an influential German philosopher. His best-known book, Being and Time, is considered to be one of the most important philosophical works of the 20th century by many professional philosophers. 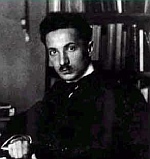 Heidegger remains controversial due to his involvement with Nazism and statements in support of Adolf Hitler. In World War II Germany, andunderground compound houses scribes who answer letters written to prisoners in an effort to hide the reality of the concentration camps and provide supernatural protection for Germany's Final Solution. Translators for each language crank out innocent, pleasant letters. Gerhardt Lodenstein and Elie Schaten run the compound of scribes and yet, secretly, they work for the resistance. One day a letter arrives from Martin Heidegger's optometrist, Asher Englehardt, now a prisoner in Auschwitz. One letter changes the whole routine of the compound and opens a door and sets in motion events that threaten the entire compound as the scribes struggle to find the exact words to respond to Heidegger. Imaginative and poetic, Thaisa Frank presents a unique entry into visualizing Nazi Germany. Historical fiction purists should be forewarned that HEIDEGGER'S GLASSES is a work of historical fantasy rather than a novel full of historical detail. In one sense, HEIDEGGER'S GLASSES reads more like Kafka than a work of historical fiction, albeit with quite a different world view. Here, the absurd situation leads elsewhere, and resistance is not futile. HEIDEGGER'S GLASSES is recommended for readers of historical fiction and fantasy eager for a haunting, poetic and even symbolic entryway into Holocaust fiction. HEIDEGGER'S GLASSES will be well received by readers with an intellectual and literary curiosity to revisit and re-examine a book and its presentation long after the last page. Thaisa Frank gives readers a richness that withstands subsequent readings and discussion. As such, HEIDEGGER'S GLASSES is recommended as a book club choice for active groups who enjoy delving into deeper and deeper aspects of a novel. As a reader who enjoys historical fiction and fantasy, Holocaust fiction and literary criticism, HEIDEGGER'S GLASSES left me wanting more historical and philosophical detail. I chose HEIDEGGER'S GLASSES as a means of joining my studies of Holocaust fiction with my studies of Heidegger's philosophy. I did not particularly find more details of Heidegger's anti-semitism or its possible connection to his philosophy either within a historical or an imaginative perspective. A number rating cannot possibly do justice to Thaisa Frank's work. HEIDEGGER'S GLASSES is an important work within the evolving canon of Holocaust fiction and a book this reader might even consider worthy of literary awards for the style of prose and the imaginative content and form. Nevertheless, more historical and particularly philosophical detail would have made this book truly outstanding beyond the marketing cycle, while those very same additions might make the book less enjoyable for other readers.